South Africa’s iconic five day Whale Trail hiking route is offered as a challenge to runners capable of embracing all 53km and 1900m elevation as a TRAIL RUNNING ULTRA, packed with spectacular mountain fynbos, technical rocky ridgelines, sandy beach stretches and endless, mind blowing, beautiful vistas all in one day. It has become a must-do for those who have already tackled the more conventional runs out there and bragging rights on this one are substantial! The Merrell Whale of Trail event is the only opportunity each year for a limited number of nature loving athletes to run hard on this trail while treading lightly on the earth. 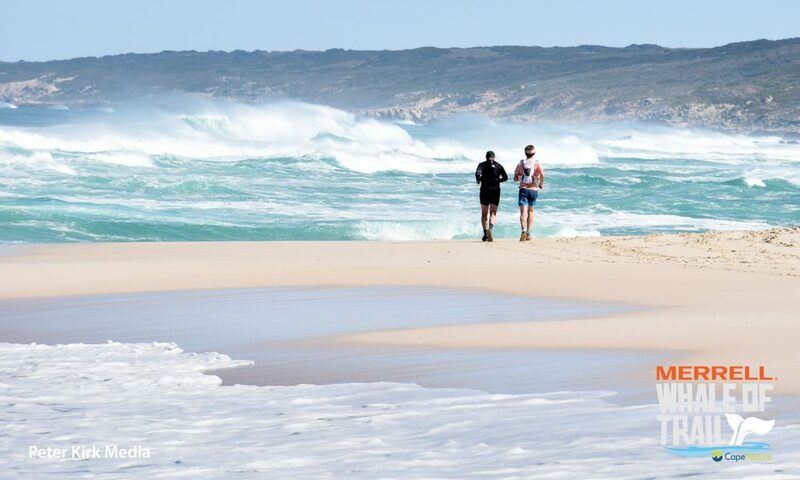 Just a 3 hour drive from Cape Town or George along the Southern Cape coast, close to Cape Agulhas, the route takes runners on a journey from the base of the Potberg mountain to the beach at Koppie Alleen in CapeNature’s flagship De Hoop Nature Reserve. The first half winds up and along fynbos covered peaks, past the Cape Vulture colony, with spectacular views of the Breede River Valley, and then descends to the enchanting Noetsie Bay, turning west and winding along the rocky shores of the Indian Ocean, with a mix of beach and coasteering trails. If this is just a few steps too far, there’s now also a 35km route starting and ending in the same glorious places, with a well designed cut through that still gives you a taste of everything that the area has to offer. Perfect for those not quite ready for an ultra distance but wanting to be a part of the incredible race atmosphere. Bang on the peak of whale season, runners are left wondering who is watching who as scores of the annual migratory Southern Right Whales and their calves continually breach out the water, spy hopping and waving their fins at the passers-by, making for the best and most enthusiastic cheerleaders. 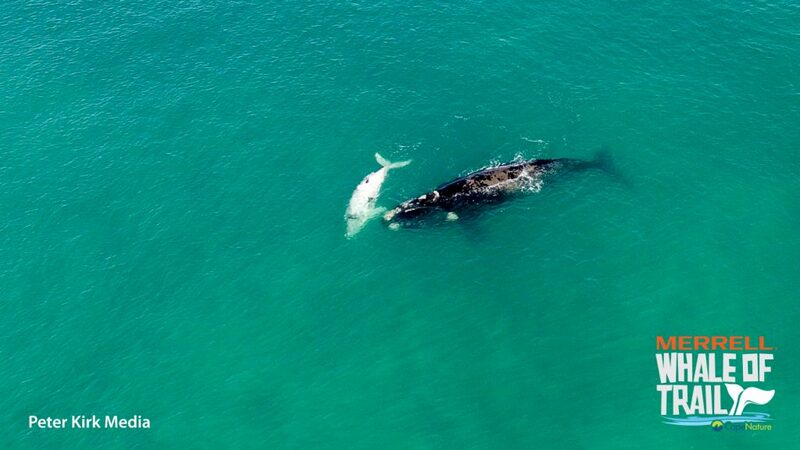 On race day in 2018 an official aerial survey counted 1114 whales in the reserve! The finish area at Koppie Alleen is a festive affair. Situated right above the beach, spectators may forget to look for their runners while mesmerised by the whales, exploring the dunes and many rock pools packed with prolific life – thanks to the long standing protection offered by the marine reserve – or enjoying the food freshly prepared by the caterers. Finishers lounge on bean bags, feast on wholesome meals and relive the day’s achievement before hopping aboard the shuttle bus back to the race village. The historic and picturesque De Hoop Collection, situated alongside the Ramsar wetland vlei offers not only sublime accommodation but also excellent guided birding excursions, nature walks and boat trips, mountain biking trails and a spa for the ultimate indulgence. Traffic in your way on the walk to the Briefing or Prizegiving dinners comes in the form of herds of eland, bontebok and the rare mountain zebra. In 2018 we introduced the Merrell Whale Journey to tie in with the race event. 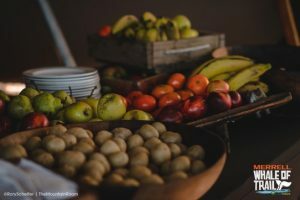 This is a unique opportunity for just a dozen decadent lovers of life and trail to gallivant along the route over two days; running, exploring and just being. Combined with sumptious eating and drinking and starlit immersive experience at the delightful Noetsie Hut with indulgent evenings before and afterwards at the magnificent De Hoop Collection. The Journey starts the day before the main race covering 28km and finishes the 25km next day to the same warm welcome and sense of accomplishment. This sold out instantly last year and this year, however we have unfortunately had to cancel the 2019 offering as the reserve will be undertaking extensive refurbishment on all the trail huts at that time and none are available for us to use. It will be back on offer in 2020.